One Day in St Maarten – Marigot and Maho Beach – Why Waste Annual Leave? Last year, Pumpkin and I made the uncharacteristic move of booking ourselves a break in December, a month in which we rarely travel long haul. With Pumpkin scheduled to work much of the Christmas and New Year week, we, like all well-trained travel addicts, took this as a green light to squeeze in one final voyage for 2015 before his work could hamper our wanderlust. Plus, the last remaining droplets of my annual leave were still untouched. You’ve seen the blog title. You know the drill. After a few days in New York City that always steals my heart, we flew to Puerto Rico to escape the fluid-filled sombre clouds of the British winter in search of Vitamin D and Caribbean Calypso, partaking in our first ever cruise. Those of you who read my first impressions on cruise travel may recall that one of the aspects I found a little offputting about cruising was the way in which it leaves such little time in each destination. What I did find highly appealing, however, was the flavour it gives of destinations you may never have visited otherwise – or even have heard of for that matter. Exhibit 1 – St Maarten in the Caribbean. The cruise booking was the first time I came to know of this pretty-as-a-postcard, mountainous island and any destination whose name comes with two differing spellings surely has a bit of a story behind it. This oddity is far from a linguistic quirk; rather, it owes its variation to the fact that part of this island belongs to the Dutch and the other part, to the French. I have never been to the Netherlands, although perhaps now, technically I have. 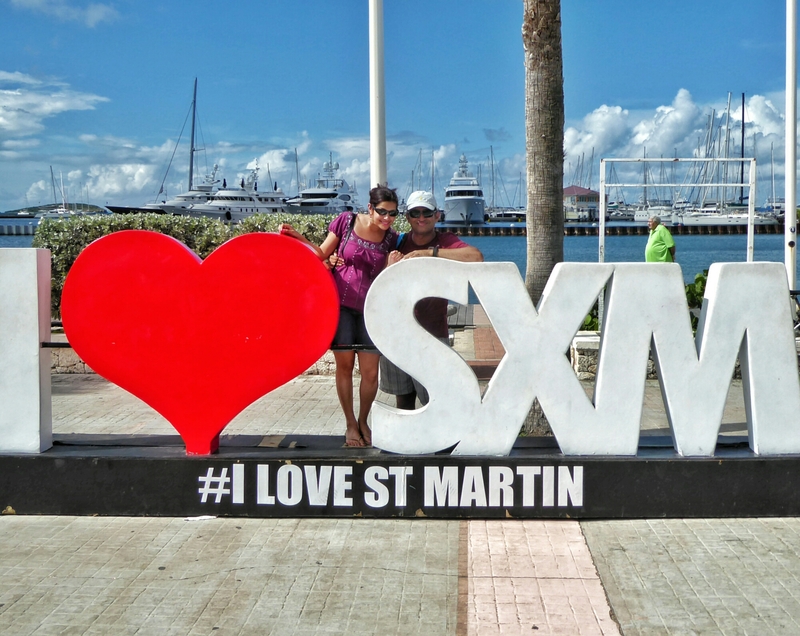 To break up the shore excursion tours we had booked at some of the other cruise destinations, we decided to explore St Maarten-St Martin independently and hopped in a taxi from the Port terminal to Marigot. If you’re anything like me, you’ll have a tendency to turn into a wilting flower in the heat so keep your eyes peeled at the cruise terminal for an unassuming little cafe with just 3-4 tables inside that sits reasonably close to the entrance. It serves a small selection of macaron ice cream sandwiches, which feel like refreshing gifts from the Gods in the midday sun. As you can probably gauge from this photograph with my Jaws-esque bite, it didn’t take me too many mouthfuls to polish it off. The French flair was immediately apparent as we strolled around Marigot’s Marina waterside with creperies dotted around, leading us towards temptation and the familiar French accents of restauranteurs extending hospitable invitations for al fresco dining at their family-run establishments. We perused menus out of curiosity more than anything else, for a cruise ship buffet breakfast leaves little room for extras. With a brief pit stop to the Tourist Office in St Martin, we decided to opt out of the uphill hike towards Fort Louis, where the vistas over the Marina are reportedly dazzling. With more time, this is the kind of viewpoint we would actively pursue but we still had Maho Beach on our itinerary and no one wants to be the person who watches their cruise ship sail off into the sunset whilst they remain stranded on shore. I am told this happens quite often! Instead, we browsed the Marigot Market, where we found mostly tourists sifting through stalls of souvenir T-shirts, trinkets and gift items. Whilst I didn’t come across much to inspire me, I was drawn to the selection of fresh juice and smoothie stalls adjacent to the market. When a day is warm enough, there are serious profit margins to be made on a freshly squeezed OJ and it was the perfect accompaniment for some market stall strolling. Before I had even managed to get my bearings about where in the Caribbean St Maarten is, Pumpkin had caught wind of the famous “airport beach”, whereby hordes of camera-laden tourists and zealous plane spotters gather to witness the bizarre moment an airplane descends directly above their heads, onto a runway mere metres away from the beach. There are Olympic athletes who can thrown a javelin further away than these aeroplanes were from us when they landed. Whilst contemplating a brief snooze on the sun lounger, you notice a coral streak bordering your shoulder strap. It stings in a benign but telling fashion that forewarns you of the raw sensation you will experience tomorrow. You fumble around for sun cream in your overstuffed beach bag, perplexed as to how you managed to over-pack even for a couple of hours on a beach. The crisp corners of that Booker prize nominee call out to you, their earthy-smelling pages longing to be caressed. Your bookmark remains as it was a couple of hours earlier,the precise angle of its lie unchanged, such is the force of WiFi in the modern age. You yearn to switch off but the society you’ve grown accustomed to corners you in other directions. In your distant vision, you spot the beach barman strolling along with a tray of overpriced fresh coconuts. The straw somehow enhances its appeal and with a perfectly adequate bottle of water by your side, your logical side transiently questions the need. But when has a holiday like this ever been about need? Hydrated and sun-protected, you resume your snooze, at least you try to until you feel a brazen gusty force of wind engulf you. Your flimsy beach bag no longer feels so weighty and the bookmark has pursued its own journey of discovery somewhere along this shore. All sounding familiar so far? I’ll continue. You tilt your head up, where thus far you have seen nothing but a flawless canvas of blue sky. Now you see a wing of an Airbus. You read its name with clarity, wondering about the personal stories that have brought each passenger here. The aircraft flatulence becomes progressively more fierce, the bellow of the engine hum more intimidating. You have never felt more aware of all the disclaimer signs around you that deflect liability if harm comes your way from the landings. Your naked eye leads you to details on an aircraft that you had only ever imagined could be viewed with binoculars. That there is the Maho Beach adventure. The thrill and exhilaration of lying on a white sand beach watching planes landing right above you; of submerging your shins in clear jade water whilst seeing aircraft trailing one another, looming in the distance and magnifying with their proximity each second. For a little sample of an Airport Beach moment, have a peek at our video clip from the day. In the two hours we spent on the beach, we saw at least 15 landings, some smaller and perhaps non-commercial aircraft, some seemed to be lower scale flights from neighbouring islands and the one that kept us waiting on tenterhooks, the grand finale for us on our one day in St Maarten was watching the international Air France Boeing A340 that had flown in from Paris. Of course the details in my preamble are embellished for literary effect. There is no snoozing on the sun lounger here – would you snooze on a runway?! If you want some time to recuperate, relax and escape with the sound of the waves, there are plenty of other beaches on the island. But for a once in a lifetime and utterly eccentric way to spend a beach day, I recommend a visit to Maho Beach. Turns out it is fascinating, even for those of us who aren’t habitual plane spotters. it gets extremely busy so if you want to nab the best spot to lie or sit, you’ll need to go a lot earlier in the day than we did. This is not a place where you’ll be able to capture beach photos without other people in them. If you’re keen to see any particular types of planes landing e.g. Pumpkin wanted to see an international Boeing, look up arrival landing times of airlines coming into St Maarten that day and plan the timing of your visit accordingly. Tens and tens of taxi drivers hang around the beach to ferry tourists back from here so you do not need to pre-book this but allow time for traffic if you’re on a cruise and need to get back in time to board. If the idea of island hopping or cruising around the Caribbean calls out to you, perhaps I can tempt you a little further with our spine-tingling morning of snorkelling with sea turtles and shipwrecks in Barbados or for a lazier day in the sun, beat the crowds at the pristine paradise Ffryes Beach in Antigua. Where is the strangest place you have seen a plane land? Thank you so much! I’m so happy to hear you liked the post! To be honest, I didn’t know anything at all about St Maarten until I went so you are already one step ahead ☺ I hope you get to the Caribbean soon – there are some utterly gorgeous islands there to enjoy! Thanks Ayla ☺ I never imagined I’d find myself eagerly watching one plane land after another as I’m no plane spotter but then again, the turquoise water & soft sand helped egg me on!! Love it, I’m a huge plane geek and Maho beach has been a place I’ve wanted to go to for a long time. For me it’s really the top reason I’d go to St. Maarten. It was a very surreal way to spend a beach day Andy! LOL. I think I lost a few years off my life hanging from that fence behind the strip. Had a lot of fun on the island though. Haha! Really Jaklien?! We loved the parts of St Maarten that we saw but I’d love to see more of the Dutch side if we ever return again especially Philipsburg. Thus is an experience my Mr Kiwi would definitely brave the beach for. I’m not sure which is more enthralling – the maceron ice-cream cake or the low-flying aircraft! One was definitely more quirky Suzanne but the other one, decidely more tempting!! Great post! Those planes flying with only a few meters above you really get everybody on their feet. You should go to Mullet Bay Beach too next 🙂 I hope to get to the French side too one day.